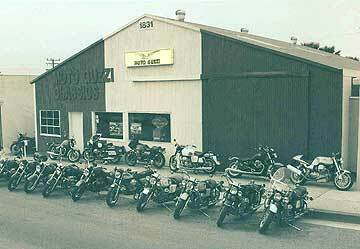 Moto Guzzi Classics has been dedicated to the service of your Moto Guzzi for over 15 years. 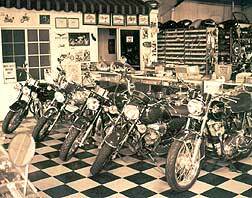 Owner Mark Etheridge is known worldwide for his award winning custom bikes, immaculate restorations, and spot-on service. This shop is not a sterile laboratory- it's where the real Guzzi work gets done. Mark's been riding and wrenching his entire life, and it shows. He's a hands-on guy who brings years of experience and common sense know-how to every bike in the shop. He will work with you personally to get the job done to your satisfaction. In addition to his expert Guzzi knowledge, Mark has a huge stash of used, New Old Stock, and reconditioned Guzzi parts to keep your bike on the road. Visit Moto Guzzi Classics for expert service, new and used parts, custom motorcycles, restorations, or just for some quick advice on your Guzzi. Stop by or call during our business hours, Tuesday through Saturday 9 to 5.